697 MADRI (697 mothers) refers to the 697 young soldiers died in the First World War in this border area of Trentino South Tyrol and buried by the Austro-Hungarian Monumental Military Cemetery in Bondo. On July 2nd, 2016 the artist Stefano Cagol called all the women to come to the small village of Bondo (700 inhabitants) in the middle of the Alps and the Dolomites for a participatory performance. Hundreds of women came from all the region and outside and walked and staid on the monumental granite stairs recalling the personal and family suffering beyond flags, troops and belongings. They became part of a new monument to life and this action has been fixed by video and photographic images by the artist. 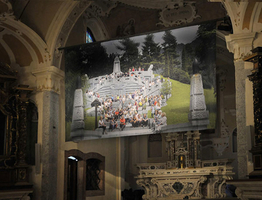 Now the artworks are on view till September 17th, 2016 by the Antica Chiesa di San Barnaba – Ancient Church of Saint Barnaba in Bondo, together with an installation (aluminum and sound) that recall, with sharp edges, the extreme conditions of the soldiers waging war on the top of these mountains that actually appear as a natural paradise. Alfredo Cramerotti is the Director of MOSTYN, the main art center in Wales; he was born in Trentino and this is the first time he comes back for an art event. Cramerotti and Stefano Cagol had the chance to collaborate for the Maldives National Pavilion at 55th Venice Biennale: Cagol as participating artist and Alfredo Cramerotti as part of the curatorial collective CPS-Chamber of Public Secrets. The lecture ‘The expanded image. The mutation of the role of contemporary photography’ by Alfredo Cramerotti is realized with the participation of Franco Marzatico, Superintendent for Cultural Heritage of the Autonomous Province of Trento. With the support of the municipality of Sella Giudicarie, BIM Valle del Chiese, BIM Sarca-Mincio-Garda, with the participation of Associazione Nazionale Alpini and Osterreichisches Schwarzes Kreuz. The iconographic and historical research is curated by Giulia Robol.